Shakti Kapoor's son,Siddhant, will reportedly make his debut by stepping into his dad's shoes. 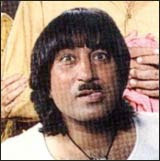 He has been chosen to portray Shakti Kapoor's role in the remake of Satte Pe Satta. Shakti Kapoor said, "Yes, Siddhant was at the party. He's been given a clean chit by the authorities and returned home on Monday morning. He is a DJ and was playing at the console, while the drugs were circulating on the dance floor." A Disc Jockey by profession, Siddhanth is so profound in his job and keeps fleeting to various night clubs across the Country. Alas! The young lad's image was mortified as he was caught by Mumbai cops. Nevertheless, his innocence has been proved after a series of interrogations. Speaking to media channels, Shakthi Kapoor said, "My son's innocence is known to everyone. Being a Disc Jockey, he travels across various parts of the Country and in that particular party; he was performing his clichéd job and nothing illegal". Adding more, Shakthi continued, "I am dead against drugs and so is my son. Well, this party should have really taught him a good lesson, so that next time he would be more careful while making up for parties as DJ". The Pub property owner is veteran filmmaker Prakash Mehra. But it is run by a group of partners. One can recall Salman Khan inaugurating the pub last year in November. Veteran producer Prakash Mehra owns the property. The pub - Bombay 72 Degree East is run by six partners. This pub was inaugurated by Salman Khan in November 2007. Also, amongst those detained is also Aditya Pancholi's daughter Sana Pancholi She was to make her film debut with Suneel Darshan's Shakalaka Boom Boom. Reportedly, she was thrown out from the first schedule in South Africa after she refused to expose. Kangana Ranaut was brought in her place to do the same role. Shakti Kapoor commented, "My son works as a DJ in that pub. He is innocent. I can guarantee you that he is not into drugs." When contacted, Pancholi refused to comment.